Lisa Mahan, Liam Mahan and Chyane Collins represented Southern State Respiratory Therapy as they passed out candy to kids Tuesday evening. Kathy and Dan Dean represented the Fayette County Republicans during Boonanza Tuesday evening and spoke with patrons at the event. 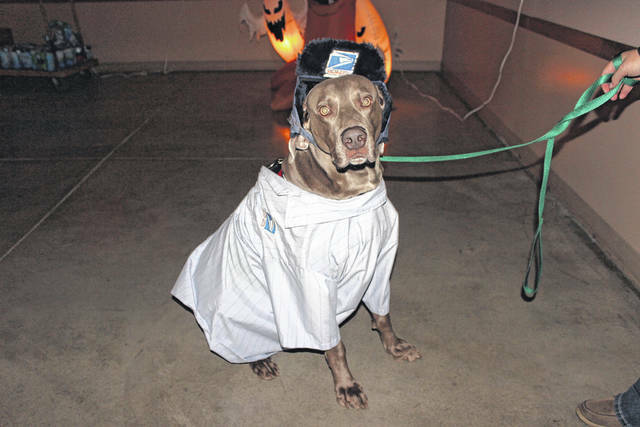 Mail Carrier, Winchester, helped to deliver sweet treats to the youth of Fayette County Tuesday. A “Minion” of the Fayette Pharmacy (Nick Beatty, pharmacy manager) had plenty of candy for the many kids attending Boonanza. The Robbins family made Boonanza a group affair and visited in a plethora of interesting costumes Tuesday. 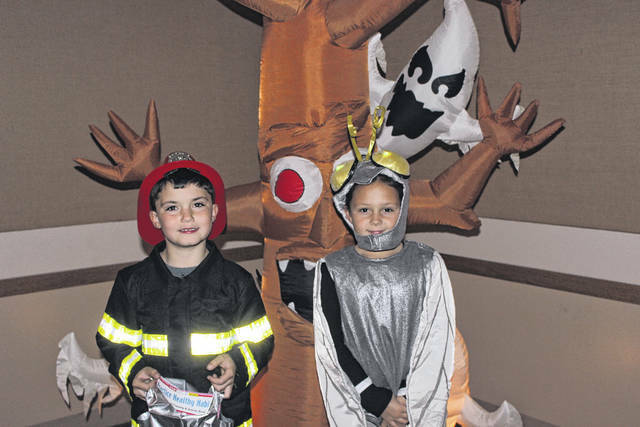 Firefighter Kamden Penwell and firefly Kaylin Myers were among the first to gather candy during Boonanza. 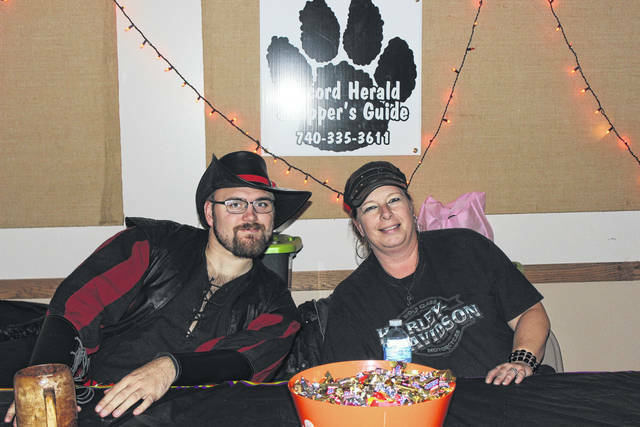 Advertising representatives for the Record-Herald, Adam Hoover and Kim Penwell, greeted many patrons to Boonanza Tuesday evening. 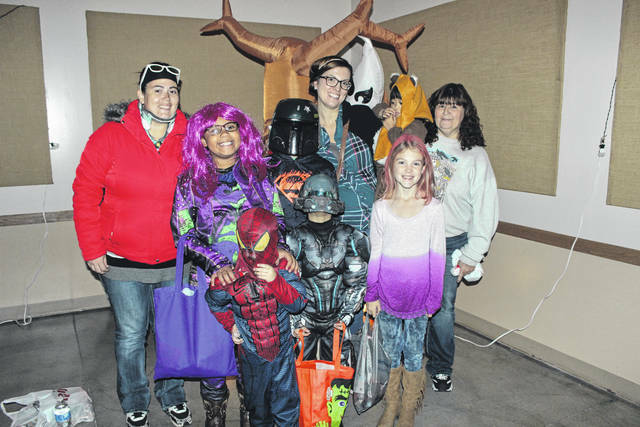 The Record-Herald held its annual Boonanza Tuesday evening at the Mahan Building to treat the youth of the community to some candy. Thanks to the many sponsors, kids received plenty of treats from various businesses. Macie Riley, Mckenzie Riley and Norma Kirby collected food donations for the Fayette County Food Pantry in front of the Mahan Building during Boonanza Tuesday. The Scarecrow, Braeden Feasel, enjoyed a quick stroll around the room to collect his harvest of goods. 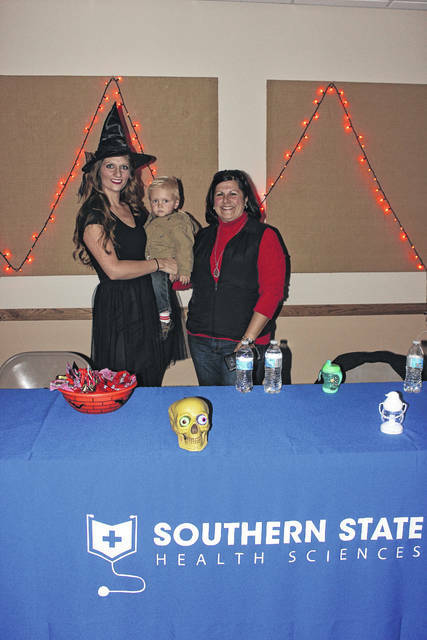 https://www.recordherald.com/wp-content/uploads/sites/27/2017/10/web1_IMG_9812.jpgLisa Mahan, Liam Mahan and Chyane Collins represented Southern State Respiratory Therapy as they passed out candy to kids Tuesday evening. 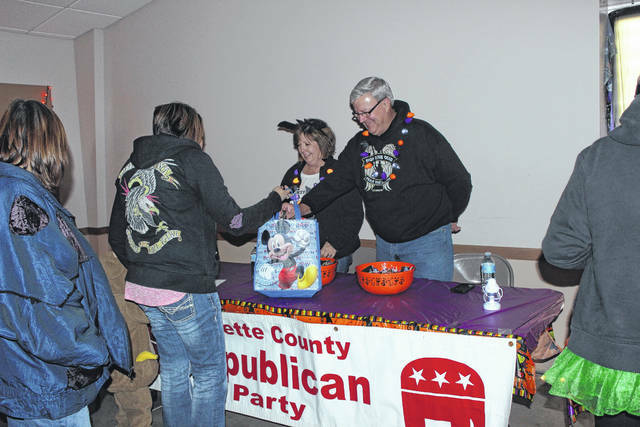 https://www.recordherald.com/wp-content/uploads/sites/27/2017/10/web1_IMG_9814.jpgKathy and Dan Dean represented the Fayette County Republicans during Boonanza Tuesday evening and spoke with patrons at the event. 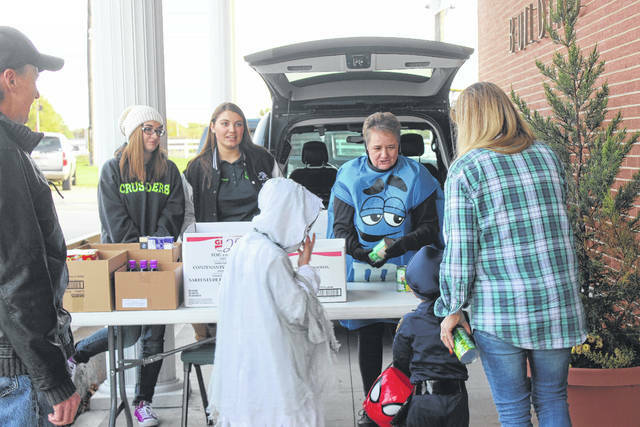 https://www.recordherald.com/wp-content/uploads/sites/27/2017/10/web1_IMG_9817.jpgMail Carrier, Winchester, helped to deliver sweet treats to the youth of Fayette County Tuesday. 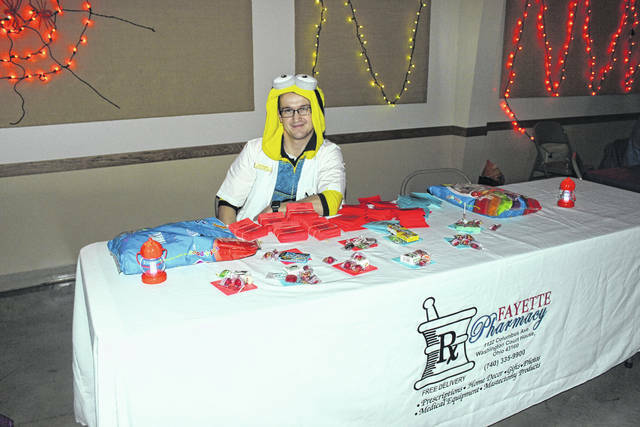 https://www.recordherald.com/wp-content/uploads/sites/27/2017/10/web1_IMG_9818.jpgA “Minion” of the Fayette Pharmacy (Nick Beatty, pharmacy manager) had plenty of candy for the many kids attending Boonanza. https://www.recordherald.com/wp-content/uploads/sites/27/2017/10/web1_IMG_9822.jpgThe Robbins family made Boonanza a group affair and visited in a plethora of interesting costumes Tuesday. 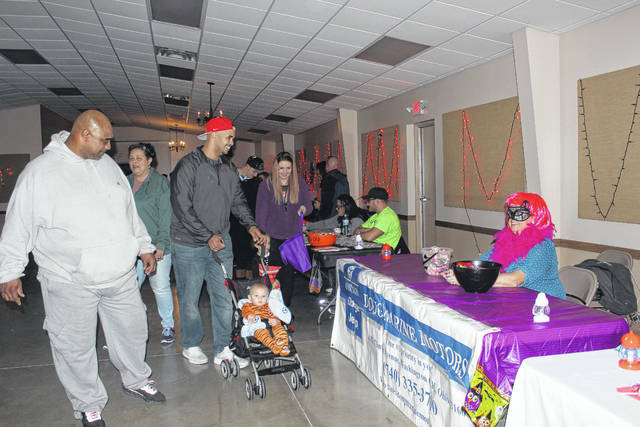 https://www.recordherald.com/wp-content/uploads/sites/27/2017/10/web1_IMG_9805.jpgFirefighter Kamden Penwell and firefly Kaylin Myers were among the first to gather candy during Boonanza. https://www.recordherald.com/wp-content/uploads/sites/27/2017/10/web1_IMG_9815.jpgAdvertising representatives for the Record-Herald, Adam Hoover and Kim Penwell, greeted many patrons to Boonanza Tuesday evening. https://www.recordherald.com/wp-content/uploads/sites/27/2017/10/web1_IMG_9820.jpgThe Record-Herald held its annual Boonanza Tuesday evening at the Mahan Building to treat the youth of the community to some candy. Thanks to the many sponsors, kids received plenty of treats from various businesses. https://www.recordherald.com/wp-content/uploads/sites/27/2017/10/web1_IMG_9839.jpgMacie Riley, Mckenzie Riley and Norma Kirby collected food donations for the Fayette County Food Pantry in front of the Mahan Building during Boonanza Tuesday. 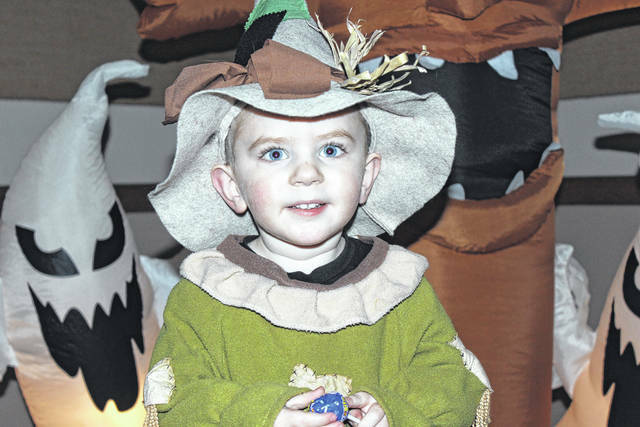 https://www.recordherald.com/wp-content/uploads/sites/27/2017/10/web1_IMG_9810.jpgThe Scarecrow, Braeden Feasel, enjoyed a quick stroll around the room to collect his harvest of goods.